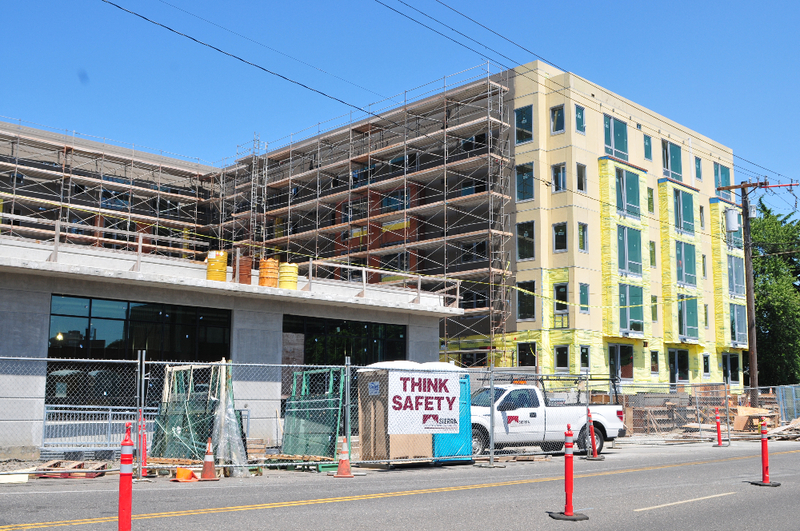 The Prescott Apartments project, located at North Prescott and Interstate Avenue, consists of a 5 and 6 story mixed-use apartment building. The project is located on a 44,690 s.f. lot. The project features approx. 10,400 s.f. of commercial, approx. 114,000 s.f. of residential and 41,100 s.f. of below grade parking. Scopes of work include: CIP concrete, post tensioned concrete, gypsum cement underlayment, unit masonry, structural steel framing, steel decking, cold formed metal framing, metal fabrications, decorative metal railings, rough carpentry, sheathing, shop fabricated wood trusses, glu-lam construction, hot fluid applied waterproofing, traffic coatings, water repellents, thermal insulation, weather barriers, metal roof panels, metal wall panels, siding, built up asphalt roofing, sheet metal flashing and trim, roof accessories, penetration firestopping, joint sealants, HM doors and frames, wood doors, OH coiling doors, sectional doors, aluminum framed storefront, vinyl windows, door hardware, glazing, mirrors, louvers and vents, non-structural metal framing, gypsum board, tiling, acoustical tile ceilings, resilient base and floorings, carpeting, painting, staining, signage, toilet/bath/laundry accessories, fire extinguishers, metal lockers, postal specialties, glass shower enclosures, residential appliances, window blinds/shades, manufactured wood casework, hydraulic elevators, fire suppression, plumbing, HVAC, electrical, low voltage, communications and signals, electronic safety and security, earthwork, asphalt paving, concrete paving, joint sealants, landscape and irrigation, site furnishings and utilities.